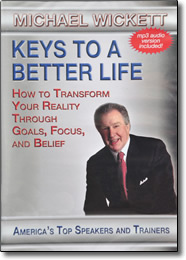 Keys to a Better Life DVD by Michael Wickett – Free Video Clip – Save! Imagine it’s one hundred eighty days from now, and your life is dramatically better. Your health, relationships, and career goals are all falling into place. You’re making more money, and feeling more at peace with yourself. You’re excited about your future, while living in the present. This can be your reality, as you implement the steps Michael Wickett outlines in this captivating program. First you’ll discover what may be holding you back. Then you’ll embark on a journey towards creating your ideal compelling future, and learn the time-proven, critical steps for making your dreams a reality. You’ll also discover the power of forgiveness, how to change your perceptions, and how to be more focused than ever. Whether you are already living your dreams, or could you some inspiration, this program will give you the tools, direction, and motivation to transform your most important aspirations into realities.